Here we are finally - my two entries for this year's Quilt Show. These are just quick snaps, I'll do longer posts with more photos and stories about them another day. 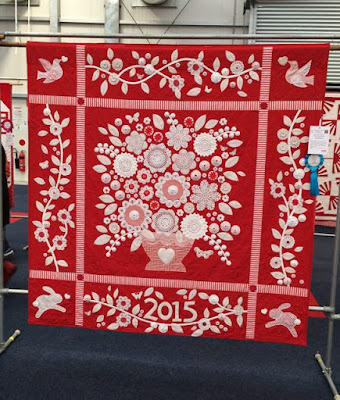 First up is Blooming Doilies which won the Judges Commendation Award for the Predominantly Hand Quilted category for the Red & White Challenge. When thinking about the red and white challenge cotton doilies came to mind, they are a favourite white thing and look to me like flowers. All they needed was an urn, leaves and a red habitat to bloom. " My second entry was Undercover Colour. It didn't win any awards but it was popular with viewers for it's surprise factor. Each shape hides a burst of colour. 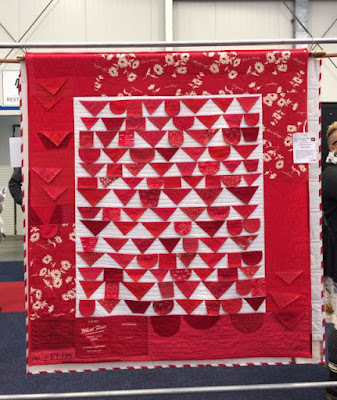 Maybe it's a game - point at a shape and guess what colour lies beneath, or perhaps it's just good to know a red and white quilt can also be colourful and scrappy. It's been a fun day full of catching up and chatting with people. I only saw third of the quilts, it's lucky I'm going back on Friday. I couldn't be more pleased for the Best in Show winner. Karen Terrens quilt, Sanderson's Apprentice, is sublime! 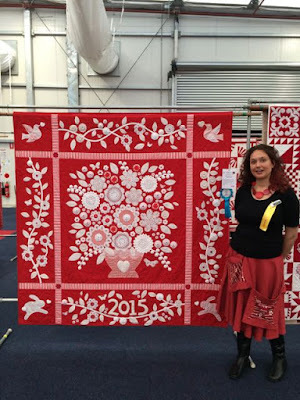 If you're interested in seeing the winning quilts pop over here to the Sydney Quilt Show Prize Winners site. Congratulations Rachael! Your Doily blossoms are beautiful! I love the background peeking through the lace. Hand-stitching on the leaves is so perfect. I so badly want to see all these quilts in person! Undercover Color is a fun quilt. I love the assortment of textures under the red shapes. Enjoy your visit on Friday. The girl just keeps on winning! How awesome for you! Were viewers specifically told they could touch Undercover Colour? I find the quilt police get screamy at shows if you even get close….! Congratulations on the Judges Commendation. Ilike the repurposeing of vintage doilies into a contemporary medallion quilt. Your looking good next to your red and white quilt. Congrats Rachael Daisy! Your work is full of fantasy, both modern and traditional, it is really a great medaillion quilt! I like the other one so much too, everyone wants to touch it! Congratulations Rachael! Your beautiful quilts continue to delight! And I shake my head with amazement-where do you get your incredible ideas from! I LOVE the doilies- that is SO Rachael! And the little coloured 'flaps'!! I wish I could see them in real life- I bet they are even better!!! Congratulations, I just love your red Doily Blossoms. Such a fun mix of modern and traditional. Your quilts just make me smile! Congratulations! The crispness of the red and white is so striking! How clever of you to use doilies as the flowers. The hidden colors in Undercover Colors is something children would love exploring! Such fun & creative quilts! Rooted in tradition but very much of the present & beautifully made. Congratulations Rachael!!! Your quilts are beautiful -- you have such a fun sense of play and surprise. Fantastic job -- as always!!! Both quilts are wonderful. I like the little hidden pops of colour - it would be a great quilt for a child. Congrats on the win on your Doilies quilt. It is stunning! Blooming doilys is breath-taking and I just love the fun about Undercover Colour. It's gorgeous too, besides the fun ! Fabulous comes to mind when I look at the Blooming Doilys quilt. Congratulations! Doilies and yoyos and decorative stitches...can't go wrong with that combination. I really had to smile at the details and interesting choices. It's gorgeous and fun. Good job! And I love surprises, so I think the second one is great too. You've been very busy, haven't you? Wow, what wonderful quilts! Doilies - what a great idea! Congratulations. Blooming Dollies is such a beautiful fanstiful garden and Undercover Colour is totally delightful. Enjoy the show! I love your Blooming Doilies--so creative and charming! Undercover Colour is pretty cool too--your brilliant ideas seem to be endless--congrats!! Blooming Doilies is brilliant! Love the 'wabbits' at the bottom. I was at the winner's site ( I thought) but couldn't find you! I hope you got something for your imagination going full bore and on that note......Undercover was VERY CLEVER but that is YOU. :) Wonderful and will look foreward to hearing more about them. Yes, the deer and roses quilt was amazing. Congratulations again!! Congratulations, Your quilts are both amazing. I love the "surprise" one. What a clever idea. I can understand why so many people would like it. Congratulations and well done!!! I love the red and white doily quilt, it's so creative and so you :-) That's really cool that it won. I wish that I could see it in person. Congratulations! Your quilts are lovely! BEautiful quilt and beautiful girl (what ethnic origin are you)?? so pretty..Creative quilt and creative girl...how about another pix of your new studio? Anyway...love is the only answer and I love this post!!! Well done - again! Your quilt is fabulous, very dramatic , super. Love your outfit too. Enjoy your second day at the show on Friday. Well done Rachael. I love both your quilts . Red and white quilts are a big favourite of mine. That is one special quilt, fabulous work on this lovely winning piece!! As always your quilts are sooo special and original! Your work always puts a huge smile on my dial! Congratulations lovely lady! Warm congratulations RAchael...how exciting! Loving the Undercover colours...always such a lovely burst of colour with your quilts! You look gorgeous too! Love the integration of the doilies and yo yos, Gawd woman you are so clever! Congratulations Rachael, so excited for you, bet you are jumping over the moon. And both are so pretty. wow! Rachael! Well done! The doilies is amazing...I want to know where you find the time! That is one very intricate quilt! SO stunning!! Excited for you!!! Congratulations Rachael - well deserved! 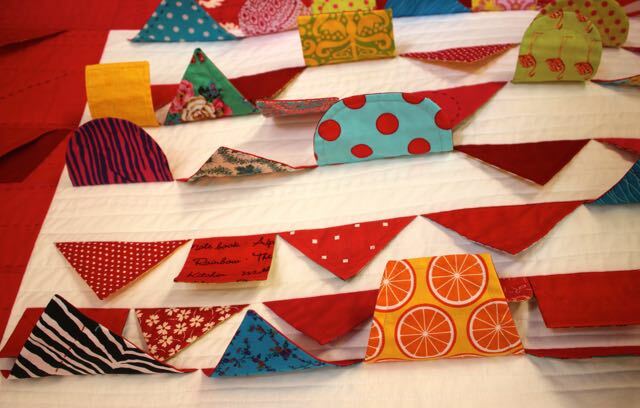 I do also love your "colourful / scrappy" red and white quilt - very clever. It was a pleasure meeting you yesterday - I have just booked to come back for Friday and Saturday - can't wait. Congratulations!!! I am blown away by both quilt entries. Your creativity is endless. Such wonderful ideas in every quilt that you make. I love the way you have used the doilies to create such a beautiful floral display. Gorgeous work with the borders, birds and bunnies, too. And there is a lot of wonderful detail to be discovered. 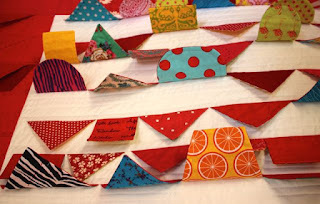 What a fun idea with the second quilt to have little surprises hiding under all the different shapes. And using different fabrics in the borders creates a wonderful effect. Well done on the Judges Commendation!! Congratulations Rachael. You keep on coming up with amazing designs, with wonderful twists. Both your quilts look fantastic. I hope that some day I'll get to see some of them in person. wow - your R&W quilts are amazing! Congrats on the Judges ribbon. that is a high high honor! I love the doilies. Your look beautiful and I'm so happy for your - it's your year!!! 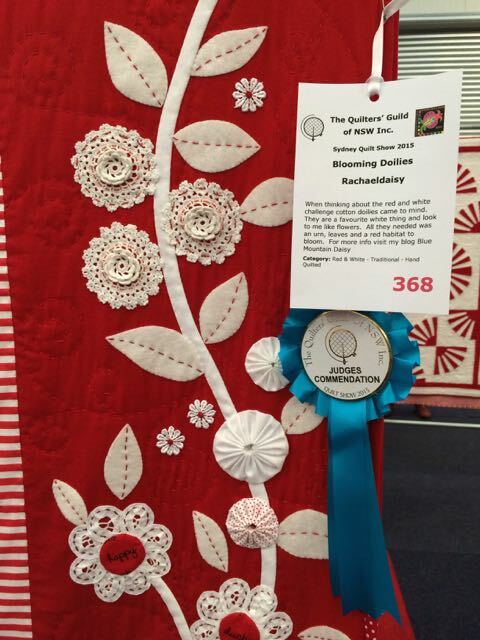 Congratulations on both your wonderfully whimsical quilts, Rachael. I had such a fun time as a white glove lady yesterday afternoon flipping up the flaps on Undercover Colour to reveal your colourful surprises for our visitors to the Quilt Show who loved it! So delightfully subversive 😉. Well done!!! Congratulations! Love your quilt. Enjoy the show. You are the Quilting Terminator! She feels no pain and she absolutely will not stop until all the quilts are done. You always astound me. The doily quilt transforms the doily from twee to grand Victoriana and those bursts of colour in the other quilt are like a secret washing line of delights! Well done! Rest now please...just for a minute. Congratulations again Rachael :-) I love the pop of colour one - what a fantastic idea, really fun! Loved loved LOVED both your quilts. The doilies were exquisitely arranged and the undercover colour was so contrary how could I not love it! We may be cut from the same cloth. Also it was super lovely to have met you and I'm so glad we got to spend some time together. Next time I'll attempt to have a normal voice! Fabulous! I love all the little bits that show your attention to detail. Congrats Rachel, I love them both - what a neat surprise of color on the second, and that first one is beyond stunning. I also love your & quilt in your last post - love love love and congrats on your new machine! These are both wonderful quilts! The doily quilt is stunning and the second one is delightful in its surprises. Congratulations, Rachael ~ well deserved! Well done! It was worth the effort to get them both finished. They are both such fun quilts, while being totally different interpretations of the theme. I love them. Your creative mind astounds me again. Wow! I love them both. You've been a busy girl! The doilies are a brilliant idea, as are the fun little flaps with surprises underneath. Leave it to you to come up with new ideas! Such beautiful quilts! I particularly adore your doilies quilt. Did you have to do much shopping to find the right shaped doilies? My sister used to crochet doilies. I find that way too fiddly for my fat fingers. That quilt will look hanging on a wall. Do you have a place in your home to show it off? I can really imagine having fun with my son trying to pick what lies underneath all those flaps. Very clever idea. Red and white quilts are just timeless no matter what the design (modern v traditional). I never made it to the quilt show. I jinxed myself. I managed to get Gabe's flu and was getting over that when all of a sudden I went downhill with a chest infection right when the show was on. But I was so sick it didn't bother me at the time. But now i am finally feeling better I am kicking myself for missing getting a fix of all things quilty. Thank's for sharing your quilts so I can see what you entered. Your two quilts are lovely! I have loved seeing medallion quilts lately and yours is exceptional. I checked out the winners and the symphonic buzz quilt is pretty darn amazing. Would have loved to see them all in person!